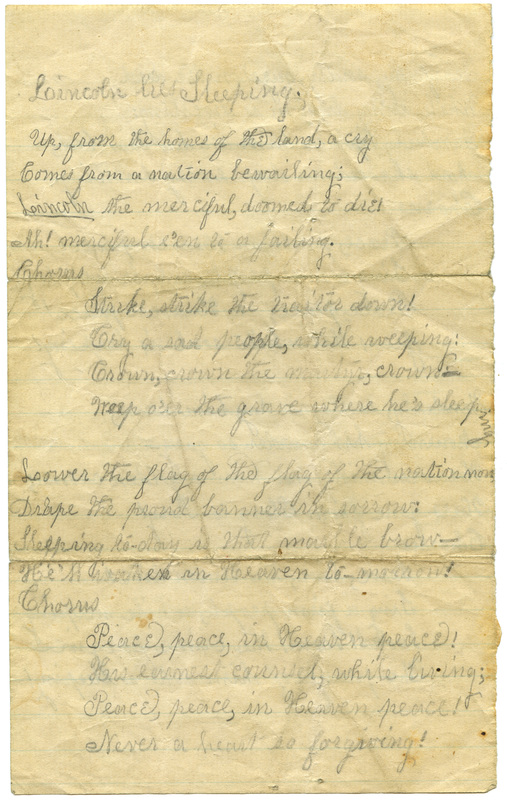 A handwritten ballad in tribute to Lincoln. Lincoln the merciful, doomed to die! Ah! merciful e'en to a failing. Strike, strike the traitor down! He'll waken in Heaven to-morrow! Peace, peace, in Heaven peace! Peace, peace, in Heave peace! Never a heart so forgiving! Tenderly place him in his last bed. And shroud in deep ev'ry dwelling. Peace, peace in Heaven peace! Jesus that while soul is keeping! He;s gone from Glory to Glory! Live, live, the Union live! The prayers of him who is sleeping!